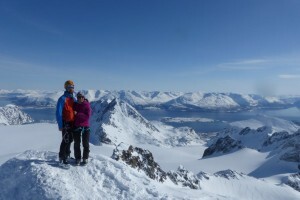 In april, Lucile and I took our skis to the very north of Norway for 19 days of skitouring above the Fjords. Between 900 and 2500 high meter each day, from powder to hard packed snow. We joined a couple of happy friends that drove all the way from France -starting in January: Lucky them ! The organisation was then easy and flexible: We could just drive wherever, cook in the heated van, and sleep: them in the van, we in the tent. Ski in the morning and chilling afternoons backing cakes and cooking fresh salmon. Roughly, first week was spent on the island of Kvaloya, NE of Tromso and still in winter conditions: temperature down to -10 at night at sea level, dark night with aurora. It is a great place with few skiers, and amazing views over the fjord and arctic ocean, as well as nice faces. After that, we had two days of bad weather, and spring was coming with night temperatures around zero at sea level, as well as nights not completely dark any more (=no more nice aurora). We went to the Lyndgen Alps area, with the top 3 outings beeing Tafeltinden after a night below the glacier, Uloya island traverse, and the great Jiekkevarri glaciar traverse. We spend the last few days on our own doing a traverse of the plateau of the Tromso Fastland via huts, ending with the Tromsdalstinden Traverse. We had to cope with a maximal 5/5 avalanche risk on the first day, and aggressive gouse on the last day, but the scenery was amazing, with most of our summits of the trip to bee seen. Putting your skis on on the beach, and skin up to glaciers under the aurora borealis, is something really special that, in my opinion, every skitourer should do once in his life. t-Shirts are now available – contact club secretary for more details. There are still some places left for this weekend trip to the Newlands Valley, Lake District (Carlisle MC Hut). More details can be found here.. 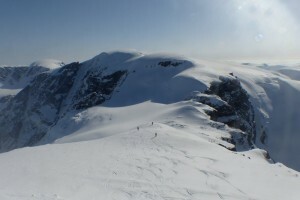 Fancy some hard remote routes on one of the most inspiring and remote crags in Scotland?